Lismore (Scottish Gaelic: Lios Mòr, pronounced [?is? mo??] possibly meaning "great enclosure", or "garden") is an island of some 2,351 hectares (9.1 sq mi) in the Inner Hebrides of Scotland. The climate is damp and mild, with over 166 centimetres (65 in) of rain recorded annually. This fertile, low-lying island was once a major centre of Celtic Christianity, with a 6th-century monastery associated with Saint Moluag and later became the seat of the medieval Bishop of Argyll. There are numerous ruined structures including a broch and two 13th-century castles. During the 19th century various new industries were introduced, including lime quarrying. During the early decades of this century the population exceeded 1,000 followed by a lengthy decline. Although resident numbers are now less than 200, there was a small increase from 2001 to 2011. About a third of the population were recorded as Gaelic speaking at the former date. 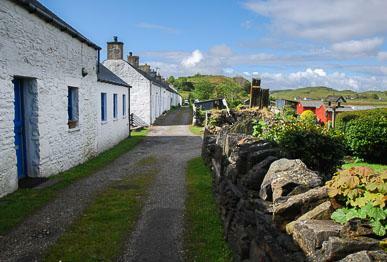 The modern economy is largely based on farming, fishing and tourism and the largest settlement is Achnacroish. Various shipwrecks have been recorded in the vicinity. "Speyside, Scotland - A mild and elegant single malt. The nose opens with a woody yet sweet tone with hints of caramel. The flavor is rich and the finish lingers with allspice and rhubarb flavors. Enoy on or off the rocks."